Mortgages rates rose for the second consecutive week, according to the latest Primary Mortgage Market Survey from Freddie Mac. Rates for a 30-year, fixed-rate mortgage averaged 4.6 percent for the seven-day period ending Aug. 2, a 0.4 point jump from the previous week and up from 3.93 percent year-over-year. The rate for a 15-year, fixed-rate mortgage was also up 0.4 points, week-over-week, to 4.08 percent. Last year during the same period, a 15-year fixed-rate mortgage averaged 3.18 percent. A five-year Treasury-indexed hybrid adjustable-rate mortgage averaged 3.93 percent, up from last week when it averaged 3.87 percent, and last year when it averaged 3.15 percent. 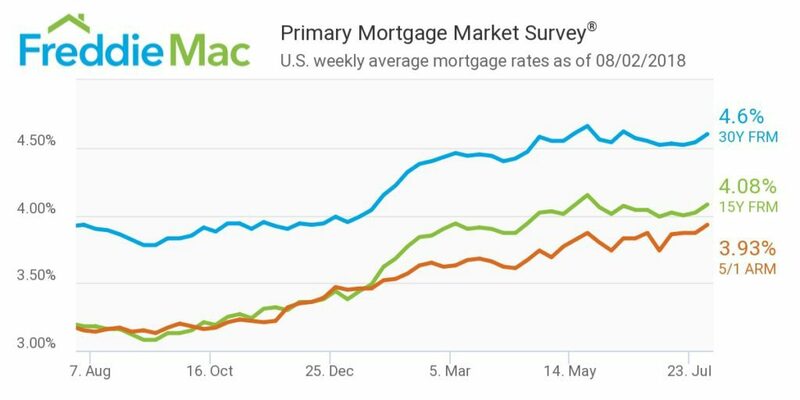 “Even with home price growth easing slightly in some markets, mortgage rates hovering near a seven-year high will certainly create affordability challenges for some prospective buyers looking to close,” Khater added.